This beautiful 18ct white gold 0.75ct diamond ring from the Vera Wang LOVE Collection is set with an oval cut centre stone surrounded by a double halo of sparkling diamonds and diamond set shoulders. A princess-cut blue sapphire, the signature stone of the collection, sits underneath the head. Vera Wang 18ct White Gold 0.75ct Diamond Double Halo Ring is rated 5.0 out of 5 by 1. 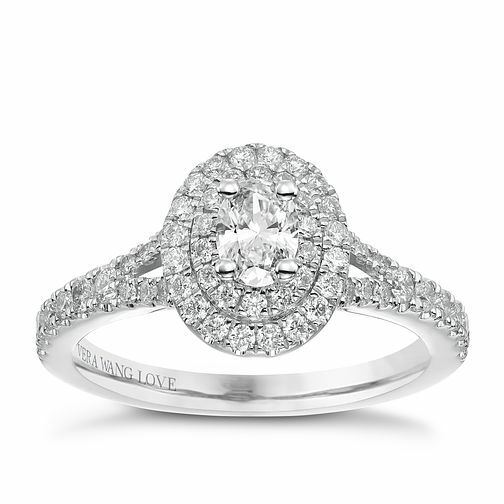 Rated 5 out of 5 by Anonymous from Perfect ring My fiancé asked me to marry him with this ring all i can say is WOW I can't believe he choose this all by himself although I did hint that I loved the Vera wang love collection. everyone has commented on how much it sparkles and shines. The picture doesn't do the ring justice Looks even more stunning on. Also you get a certificate which is great and the is packaging is stunning.